My husband likes salmon, but doesn’t love it. Most often when I say, “want salmon tonight,” he politely says yes knowing that I love it so much, but it wouldn’t be his first choice. So, when he said to me (MULTIPLE times during the meal), “This really is the best salmon I’ve ever had,” I was ecstatic. And it was a recipe I had found, tailored a bit, and pulled off after a busy day with our two crazy toddlers running around the house, and my 5-month-old to feed! Not only that but when I asked if we could make it again a few days later for my parents, he didn’t hesitate! I absolutely love playing with recipes to find and create easy, healthy options for our family. And I love recipes that don’t have a lot of crazy ingredients, so, I can find most of what I need in my own pantry. I found this one, and modified it to what I already had, and voila! SERIOUSLY good salmon. You may have seen me post about it the other week on Facebook or Instagram, and I shared the recipe with many people who asked for it. So many, in fact, that I decided I needed to share it with everyone here! Not only was the salmon delicious, but salmon has great health benefits, too. I’m sure you know most of these, but just in case, I wanted to share them here. How much of these fatty acids do we need? If you eat about 2 servings of salmon per week and you should meet your needs! What are the benefits of these types of fatty acids? Salmon is an awesome source of protein. As a Health & Fitness Coach and Nurse Practitioner I’ve found that many people I talk to don’t get nearly enough protein on a daily basis. Salmon is rich in protein, containing approximately 22.5-25 grams of protein in 3.5 ounces of salmon! You always hear people say if you’re low on potassium (which is actually quite common when I review my patients’ lab results), then “eat some bananas!” Did you know 1 serving of salmon has more potassium than a banana? Potassium has a lot of benefits, but certainly helps to control blood pressure and decrease excess fluid retention. Salmon contains an antioxidant called astaxanthin. And, I have to admit, until I started writing this blog, I didn’t even know about this awesome benefit! Why is this important? Antioxidants can play an important role in the health of your heart, brain, nervous system and skin! Wow! Salmon can potentially reduce the risk of heart disease. As mentioned above, omega-3 fatty acids can help with heart health, but additionally, salmon contains omega-6 fats and can help to lower triglycerides, also. Salmon can help aid in a healthy weight! In one 3.5 ounce serving of wild salmon, there are just 182 calories. You’ve seen this word pop up multiple times in the above benefits and that is because inflammation plays a HUGE role in our overall health and well being. Many studies have shown that inflammation is the primary cause of many chronic illnesses and diseases such as heart disease, diabetes, and cancers. Salmon can help to lower inflammation. Some studies have shown that fatty fish and fish oil can reduce symptoms of depression and anxiety. One thing I found, too, is that there is actually more health benefits when you eat wild salmon compared to farmed salmon. And my personal preference is to only eat wild salmon, anyway. If you want to read more about this controversy yourself, here are a few good links I found. Is Wild Salmon Worth the Extra Cost and Inconvenience? No matter which types of salmon you choose, wild or farmed, salmon is delicious and multi-faceted. You can cook it a variety of ways (or even eat it raw as in sushi/sashimi), and can even find it relatively inexpensive from a can! Pro Tip: Have you used tubed ginger? I just keep a little tube in my fridge and use it in lieu of fresh ginger most of the time. Don’t get me wrong, though, sometimes the real deal tastes even better when it comes to ginger, but I’ve found the tube to be so darn convenient and still gives great flavor — it’s definitely my go-to. You can find it in most grocery stores, and even on Amazon. 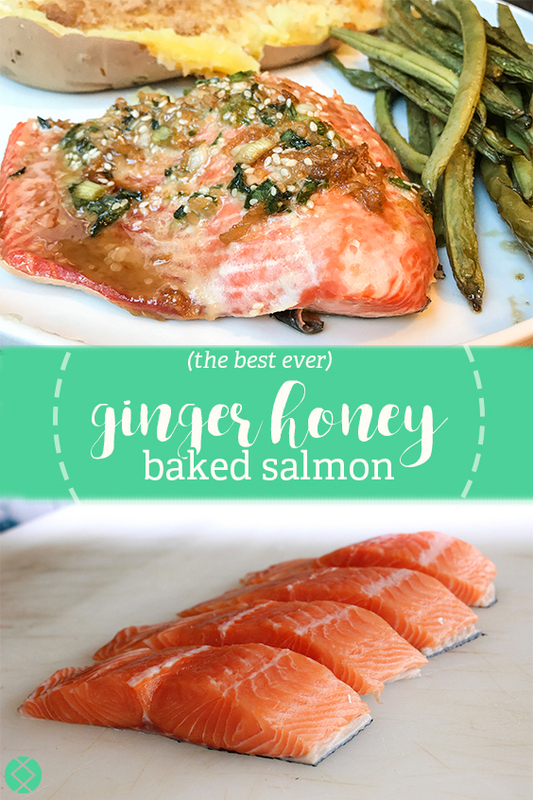 What is YOUR favorite salmon recipe? I’d love to hear it! 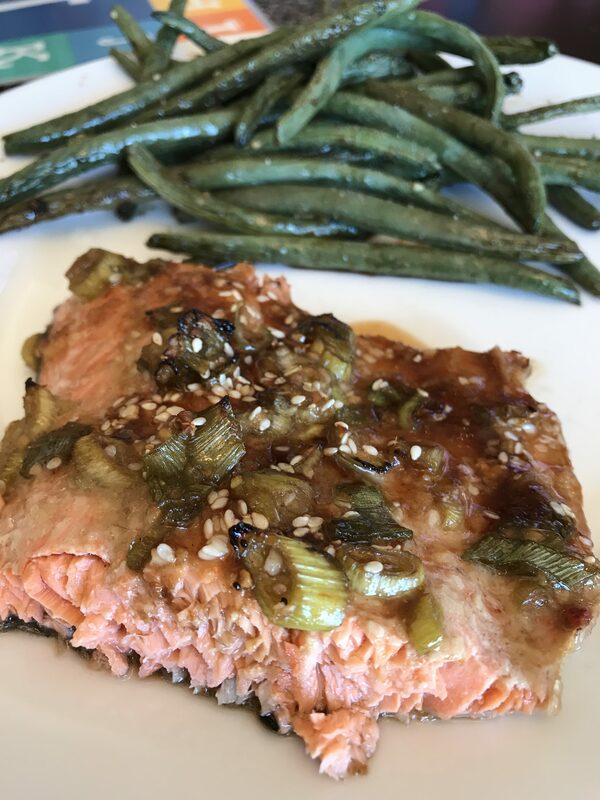 A healthy and delicious salmon recipe that even my husband (who doesn't like salmon) loved! In a medium bowl, whisk together marinade ingredients: olive oil, amino acids, rice vinegar, sesame oil, brown sugar, garlic, ginger, sesame seeds, and green onions. In a gallon size Ziploc bag or large bowl, combine marinade and salmon filets and marinate for at least 30 minutes to overnight, turning the bag occasionally. Preheat oven to 400º F. Lightly coat a 9×13 baking dish with nonstick spray.